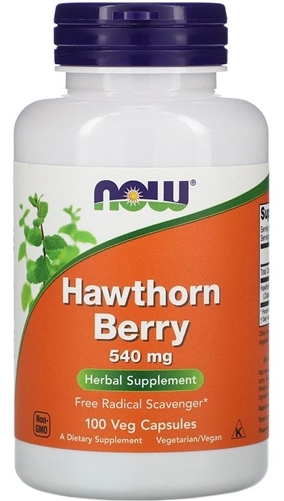 Hawthorn Berry 540 mg by Now Natural Foods is a free radical scavenger providing support for the circulatory system. Hawthorn features various compounds such as procyanidins, flavonoids and flavonols which exhibit antioxidant properties. Today, the berry, leaf and flower of the plant are all used in various herbal formulations to support a healthy heart. Hawthorn Berries have a long history of traditional use in Europe and North America as an herbal tonic. Modern scientific studies have identified a number of bioactive constituents, including OPCs (Oligomeric Procyanidins). Many of these compounds have been found to possess powerful free radical scavenging activity. Other Ingredients: Gelatin capsule and magnesium stearate (vegetable source). Does not contain yeast, wheat, gluten, soy, milk, egg, fish, shellfish or tree nut ingredients. Adults take 2 capsules 3 times daily with food or as directed by your healthcare practitioner. Avoid using product under age 18. Consult your healthcare practitioner prior to using this product if you hare pregnant, nursing, taking cardiac or blood pressure medications, or have a medical condition or a heart or blood pressure condition.